When he was in Egypt, Napoleon recruited a guard made up of Mamelukes or Mamluks. 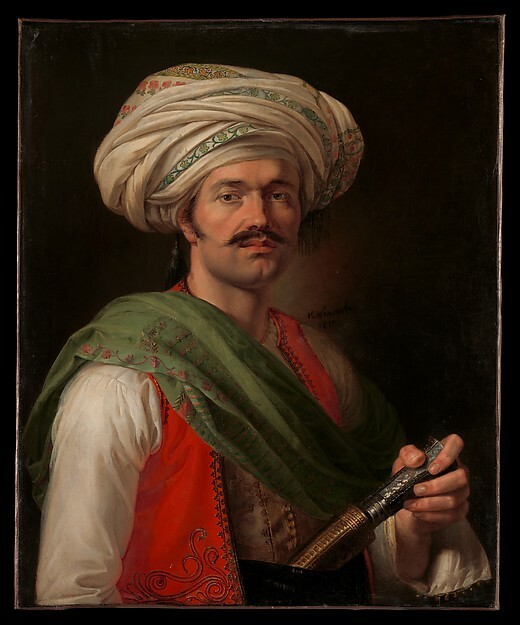 Horace Vernet left us this extraordinary portrait of Roustam Raza (1783 – 7 December 1845), a Mameluke (un mamelouk) and Napoleon’s personal bodyguard from 1798 until 1814. Roustam Raza was born to Armenian parents in Georgia. He was kidnapped and sold as a slave. He married in Dourdan, near Paris, and died in Dourdan on 7 December 1845. Raza did not follow Napoleon when he was exiled to Elba. Raza is remembered for his memoirs of the years he had spent in the service of Napoleon. I was writing a post that published itself when it was still incomplete. It has been removed and will be reinserted. What happened to Napoleon when he wore the purple was a tragedy for France as for Europe. But his march to the Pyramids did bring the Rosetta to western civilization and prepared the way for rediscovering the valley of Kings. The Mameluks saved ancient arabs from the crusades and from the mongol invasion that had destroyed the house of wisdom and Islam’s discovery of Aristotle. As military caste they did not have the skills to allow a reflowering of a Muslim Renaissance; let alone lead the way into a muslim enlightenment. Scherazade’s legend never blossomed into female emancipation. Thank you for writing to me. Discovering the Mameluks was a lovely discovery. Yes, they were superior soldiers and obviously very protective. Napoleon was introduced to him by the sheikh of Cairo. But taking along 167 scientists and scholars was une idée géniale. The institute was revived in 1836, but much of it was destroyed by rebels in 2011. When he wore the purple, Napoleon became a threat. Talleyrand could not convince him to stop killing thousands of soldiers. But he rebuilt France after the Revolution. He gave it all the institutions it needed and revived the ones that could be revived, such as l’Académie française. No, the Mameluks could no foster a Muslim enlightenment. Colonialism got in the way. That was a tragedy. On the subjects of the Crusades and the West-East conflict, I have written a historical novel; a family saga in the form of a trilogy; which highlights the role of the earlier Mameelukes who initiated the slave king dynasty’s hold on Egypty/Syria all the while examining the deeper reasons for the origins of the Crusade. My main interrogation was to ask myself to what extent were the Crusades a “game of empires” as opposed to being a clash of religions/civilzations in the Papal mold of “god wills it” papal exhortation to liberate both al-Andalus and Jerusalem from the infidel. 1° Anna Comnena’s Alexiade clearly indicates that from her perspective the original Crusaders–uncouth barbarians in her eyes– were using Jerusalem as an excuse to aggrandise the Frankish domains of a resurgent nation having conquered England and Sicily in around 1065/1090; aka just before “God wills it” was pronounced. Their REAL objective was in fact to conquer Byzantium and Constantinople! It was further proven right when the Crusaders in fact captured Constantinople in 1204, and slaughtered 80000 people robbing it of its riches (transferred to Venice who had financed the operation jointly with the 4th Cruasder army). That 60 year reign of Byzantium by the Latins was fatal to its weakening and the demise of Hellenism in 1453 when Constantinople became Istanbul subsequently. It is to be noted that in 1187 Saladin and his Mamelukes had won back Jerusalem and that the Slave king dynasty will expel the Crusader in 1291 from the “Holy Land”, inspite of the Failed Vth, VIth and VIIth Crusades. 2° The GWB Crusade of 2003 was a repeat of Saint Louis’s VIIth Crusade disaster, in that its consequences have been disastrous and the empire is now crumbling before our eyes. Huntington’s clash of civilization doctrine is a repeat of Bernard of Clairvaux’s De Laude Novae Militae pamphelt which saw the birth of the Templar order, authorising the monk to be a soldier; like a Roman legionaire of old! My trilogy covers the period 1173, where it begins in Sicily ,to the fall of Acre 1291 and therefore addresses the issue of what role the Mamelukes played in the region’s interim period between the fall of the Abbasid/Ayyubid era and the rise of Ottomans. It also addresses the role of Sicily, the flowering of sicilian culture and the Cathar uprising of Occitan france. I enjoyed writing it. I find it difficult to get it published. Self publishing is a game of pygmy in the land of Giants! Cheers! If you are interested I could send you a PDF copy for your own eyes.